T-R PHOTO BY ROSS THEDE - South Tama County linebacker Aaron Neave, back, brings down Benton Community running back Matthew Davis during the first quarter of Friday’s game in Tama. Davis finished with 124 rushing yards and three touchdowns as the Bobcats defeated the Trojans 45-13. TAMA — It’s reassuring to know the backup plan has promise, but this wasn’t the way the South Tama County football team wanted to find out. The Trojans’ season started on the wrong side of a 45-13 decision as neighboring Benton Community came away victorious from Friday night’s football opener. Kickoff was moved up 90 minutes to avoid potential wet weather that never arrived, but the visiting Bobcats surely showed up on time. Benton Community (1-0) scored touchdowns on its first six possessions and added a field goal to cap the seventh, by which time the Bobcats led 45-0 late in the third quarter. South Tama (0-1) pieced together a pair of scoring drives in the fourth quarter, but long after the outcome had been decided. 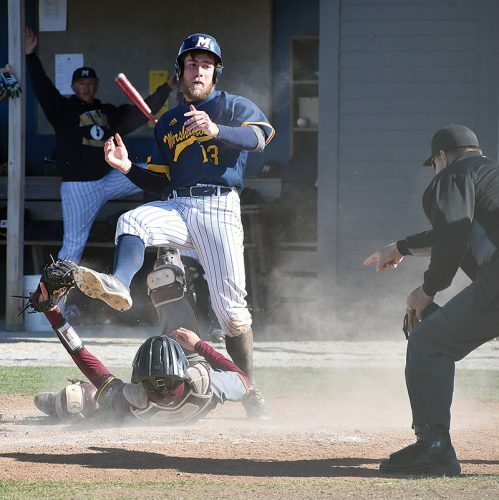 “Our eyes are open,” said STC head coach Nate Doran. “I’m not going to lie, we felt really comfortable going into this game. We didn’t know a whole lot about Benton, didn’t get a very good scouting report, but they came to play and evidently we weren’t prepared. T-R PHOTO BY ROSS THEDE - South Tama County running back Payton Vest (2) tries to spin away from Benton Community’s Matthew Davis (22) during the first quarter of Friday’s football game in Tama. The host Trojans fell in their season opener, 45-13. Benton made the short trip down Highway 30 and started strong on the game’s first possession, marching 85 yards on just nine plays (6 run, 3 pass). Quarterback Clayton Krousie capped the drive with a 5-yard touchdown plunge, and the Bobcats were off. South Tama’s opening play was an unfortunate precursor to the rest of the evening for the host Trojans. Quarterback Drake Crawford lost 9 yards on the play and after a quick three-and-out, Benton marched 41 yards on another nine plays to hit paydirt again. Matthew Davis dove in from 3 yards out, scored again from 2 yards after another South Tama three-and-out, and Benton led 21-0 just three plays into the second quarter. Crawford’s first of four pass attempts on the night was reeled in by Benton’s Turner Schroeder instead, overthrowing Class 3A state high jump champion Keith Keahna on the play. The two hooked up for 48 yards later in the game, but South Tama’s offense didn’t look sharp for much of the contest. The Trojans totaled just eight first downs, and none of them before switching to a triple-I formation midway through the second quarter. STC gained 53 yards on 13 plays that absorbed 7:08 of the clock, losing a 20-yard touchdown run by Payton Vest to a holding penalty before turning the ball over on downs. Down linemen Cael Kellogg and Mickey Wanatee even put on different uniforms to become eligible as blocking tight ends, and the Trojans gained their first considerable yardage before penalties brought the drive to a halt. “[Crawford] had his jitters,” Doran said of his signalcaller. “When a guy wants to throw and when he can’t throw, his first instinct is flight. He’ll get over that. He’ll learn his bearings and he’ll be able to stand in the pocket a little bit so we can get guys going. South Tama’s try at the triple-I was both a part of game prep with potential wet weather looming and a staple of Trojan football. Running backs Tanner Walz and Vest found wiggle room and the drive had hope until back-to-back penalties interrupted it. But Doran said that’s still the back-up plan. Down 45-0, the Trojans turned to sophomore Matt Wiese at quarterback, and his head-down running style yielded South Tama’s first scoring drive of the night on the first possession of the fourth quarter. Wiese nine times for 52 yards in STC’s base offense, Vest added a carry for 3 yards and Walz toted the ball twice for 16 yards, including an 8-yard dash into the end zone. Crawford came back into the offensive huddle for the Trojans’ final possession, connecting with Keahna before scrambling 10 yards for a touchdown himself. 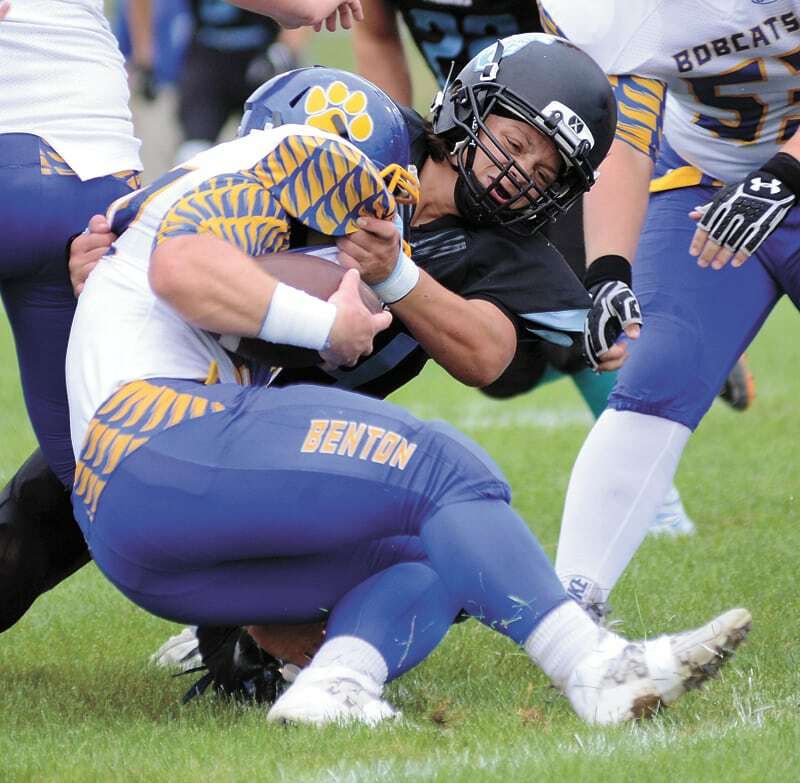 Uriel Martinez connected on his last of two extra-point kicks, and South Tama’s late scores softened the blow of Benton’s decisive victory. “[Our quarterbacks] are two completely different people,” Doran said. “Matt Wiese is a linebacker playing quarterback, he’s a powerhouse, he’s a sophomore but he plays as big as he can play. We’ve got a good future with him, but right now Drake is the one that’s going to get it done for us. 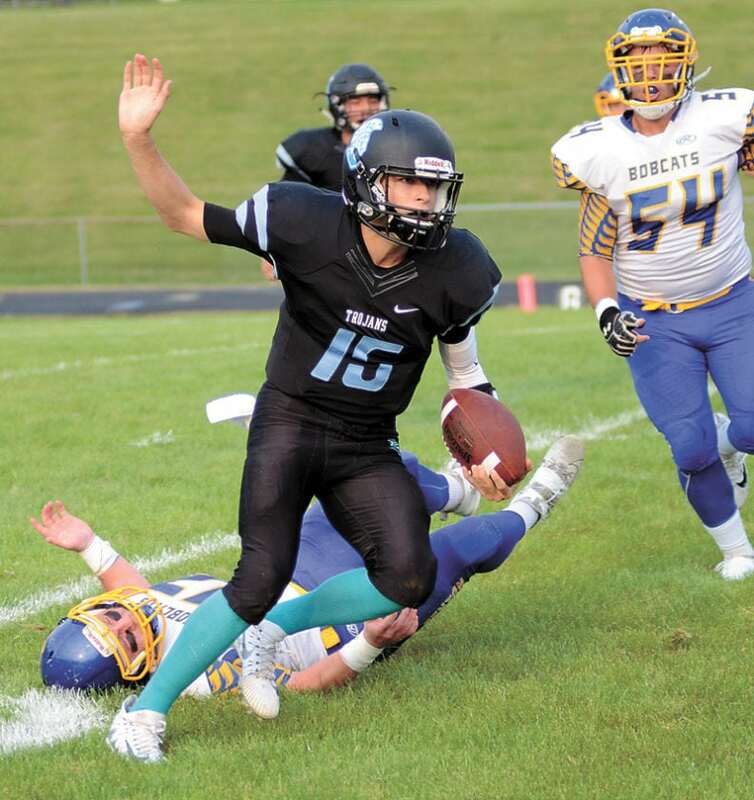 South Tama finished with 226 yards of total offense, but turned the ball over twice and committed seven penalties. Wiese piled up a team-leading 52 rushing yards on his only drive, while Walz ended with 51 yards on 12 carries and Vest had 41 on seven tries. Vest led the STC defense with six tackles, Aiden Waseskuk made five stops, while Aaron Neave and Tyrin Lasley both had four tackles. Davis led Benton with 12 carries for 124 yards and three scores, while Krousie completed 14 of 17 passes for 205 yards. Jack Shaw made six catches for 107 yards and two scores and the Bobcats finished with just two penalties and no turnovers. 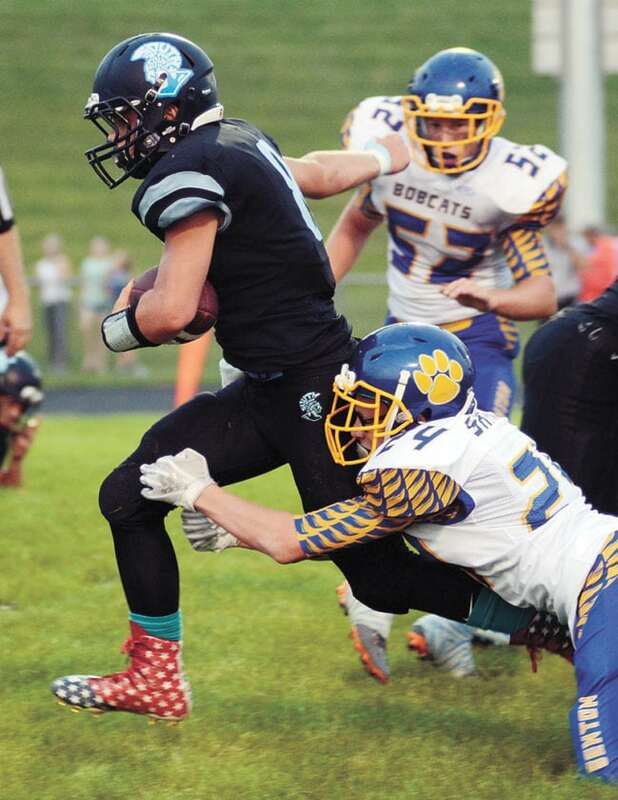 South Tama takes to the road the next two weeks, visiting Independence and Bondurant-Farrar before returning home to host Nevada in Week 4 in the final non-district game for the Trojans. BC — Clayton Krousie 5 run (Zachary Brecht kick), 8:31. BC — Matthew Davis 3 run (Brecht kick), 3:11. BC — Davis 2 run (Brecht kick), 11:57. BC — Jack Shaw 4 pass from Krousie (Brecht kick), 9:37. BC — Shaw 13 pass from Krousie (Brecht kick), 1:28. BC — Davis 54 run (Brecht kick), 8:44. BC — FG Brecht 27, 2:02. STC — Tanner Walz 8 run (kick failed), 5:50. STC — Drake Crawford 10 run (Uriel Martinez kick), :13. 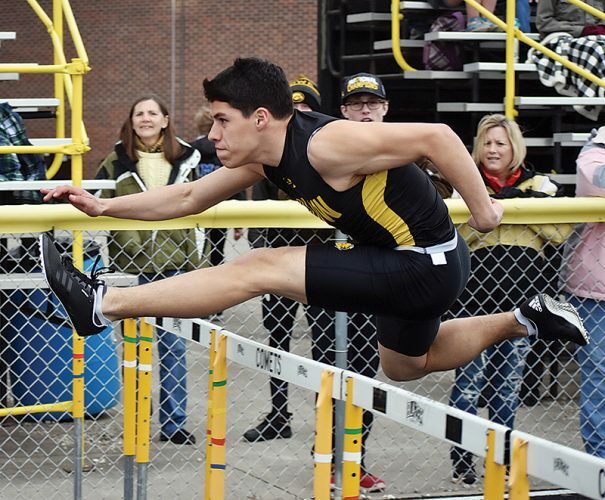 RUSHING — BC: Davis 12-124, Hunter Northrup 3-24, Krousie 3-9, Wyatt Bieschke 2-8, Adam Hansen 1-8, Team 1-(minus-1); STC: Matt Wiese 9-52, Walz 12-51, Payton Vest 7-41, Aaron Neave 1-1, Jesus Chavez 1-(minus-1). PASSING — BC: Krousie 14-17-205-0, Ethan Ewirather 1-2-2-0; STC: Clayton 2-4-82-1. RECEIVING — BC: Shaw 6-107, Nathan Michels 3-61, Turner Schroeder 2-20, Jacob Thompson 1-5, Hansen 1-2; STC: Keith Keahna 1-48, Neave 1-34.